The shared enjoyment of a meal belongs to the distinctive dignity of human life. The need to eat is a reminder of the creature’s dependence on divine providence, whose generosity always directs the world toward its flourishing. “The eyes of all look to you, and you give them their food in due season. You open your hand, you satisfy the desire of every living thing” (Ps 145:15–16). Man’s unique task of sowing the earth and placing its bounty at the service of his family and community is emblematic of his participation in God’s creativity, and every human culture is intimately shaped by the labor and ceremonies surrounding its food. The natural importance of eating is superabundantly confirmed when God gives himself to the Church “for the life of the world” (Jn 6:51) in the eucharistic sacrifice. 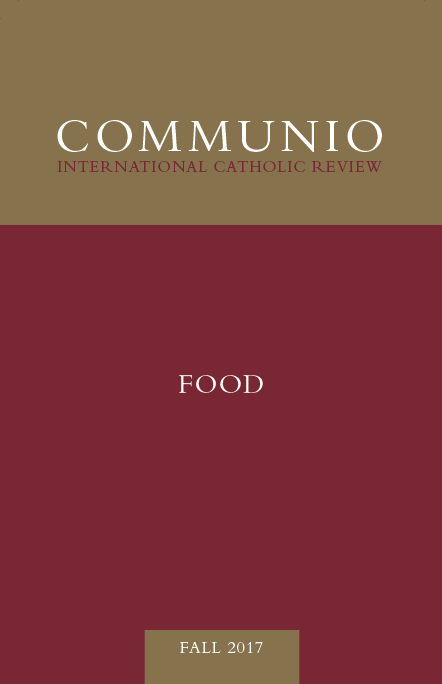 In the face of commonplace reductions of food to a resource, whether of mere nutrition or of mere pleasure, the authors gathered here seek to recollect the dignifying goodness of food—in its cultivation on the farm, its reception in the home, and its offering in the liturgy. Sister Noëlla Marcellino considers how the practice of cheesemaking exemplifies the Benedictine integration of work and prayer in “Sacro Speco—St. Benedict’s Cave: The Roots of Monastic Cheesemaking.” Marcellino tells how monastic communities took up the tradition of this craft, which has its roots in prehistoric civilizations, and infused it with the marks of the Rule of St. Benedict. The task of ripening cheese, she explains, acquaints the cheesemaker with the humility of the earth and the flesh. Cheesemakers follow St. Benedict’s exhortation to “To keep death daily before one’s eyes” in their “work in a cheese cave, because cheese reconnects us with a very earthy side of life—with decay and decomposition.” On Marcellino’s account, the monastic adoption of this ancient art represents at once human stewardship over creation and, as a form of memento mori, an exercise in Christian hope. In “Reason for Being: Festivity, Perfection, and the ‘Very Good,’” Erik van Versendaal dwells on the place of the commemorative feast within man’s ordination to delight in the world and to offer it in grateful worship. “His praise of God, arising from his concrete fruition of particular creatures, is meant to embrace representatively all things. Festivity is the communal act by which persons rejoice in being and together realize the meaning of creation by returning it to God.” Fellowship and hospitality serve this end insofar as those who break bread together nourish one another by their convivial presence. In the end, Christ’s oblation in the Eucharist reveals the sense in which festivity, and the gift of self it betokens, is the exuberant purpose of all life in the flesh. In “Ordering All Things Well: The Role of Eating in the Old Testament,” Anthony Pagliarini unfolds how food is situated within Sacred Scripture’s vision of creation and covenant. According to biblical anthropology, “[e]ating is the practice wherein men and women exercise dominion and manifest their divine likeness,” so that the family meal shares in God’s ordering of the world. Pagliariani goes on to discuss how Israel’s dietary regulations, and its cultic sacrifices, contribute to humanity’s original vocation. “The keeping of Kosher extends God’s creative activity of separating, and the table fellowship of the altar completes the creative work by drawing creation into the communion and rest of the seventh day.” Thus purified, food serves the rectification and sanctification of postlapsarian man, offering a foretaste of his eschatological dwelling with God.